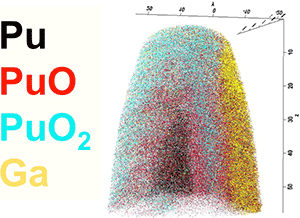 The experiment produced a 3-D graphical atom-by-atom representation of each needle—in this case showing plutonium, plutonium oxide, plutonium dioxide and gallium components. A groundbreaking experiment at Pacific Northwest National Laboratory (PNNL) that employed novel methods to safely create and analyze plutonium samples could prove influential in future studies of the radioactive material. "The experiment provided interesting data," says researcher Dallas Reilly, “but the methods we used to conduct the work will be of high interest to national laboratory and university communities, and could help advance research in legacy waste, national security, and even nuclear fuels." The experiment started with a nine-gram ingot of plutonium metal produced in PNNL's Radiochemical Processing Laboratory (RPL). In December 2017, the material was placed in a focused ion beam instrument at RPL. The instrument was used to remove smaller samples from the metal, and then shape those samples into tiny "needles." Next, Reilly explains, the needles were "free-released" (a process that enables movement of minuscule quantities of radioactive material without radiological controls) and carefully transported to the Environmental Molecular Sciences Laboratory (EMSL), a DOE Office of Science User Facility located at PNNL. At EMSL, the needles were placed in an Atom Probe Tomography (APT) instrument, which sheds atoms, one small layer at a time, from each needle. The atoms were detected and then factored into mathematical formulas to help create a "reconstruction"—essentially a 3-D graphical atom-by-atom representation of each needle. Although the reconstruction provided some interesting insights about the material, the more noteworthy aspect of the experiment was the sample creation and analysis process. The ability to move a plutonium sample from the RPL, a Hazard Category II Non-Reactor Nuclear Facility, to a non-radiological facility like EMSL—and then safely use instrumentation not available at RPL—is a major step forward in more fully tapping research capabilities at PNNL. The planning for this type of experiment started a number of years ago and has involved multiple PNNL research organizations, as well as numerous health and safety experts. Reilly was part of a team that approximately two years ago put forward a free release workflow document to enable easier, and safe, movement of tiny samples outside of radiological controls if certain thresholds, including Nuclear Regulatory Commission surface contamination limits, are met. The free release workflow, coupled with a diligent staff effort to ensure necessary health and safety requirements were in place, facilitated the APT experiment. "For the experiment itself, several of us worked long hours for three days, but we successfully completed the task, and did so safely," Reilly explains. "There are risks in a project like this, but we managed the risks in an intelligent, thoughtful way, aligned with stringent safety standards." Reilly and colleagues used the same experimentation process in a PNNL project to study plutonium particles from the Hanford Site and reveal information about particle composition. In addition to providing new knowledge that could deliver impact in multiple disciplines, the experiment method makes the broader scientific community more aware of the advanced research capabilities available at PNNL. Funding: PNNL’s Laboratory Directed Research and Development (LDRD) Program via the Nuclear Process Science Initiative and an “Open Call” LDRD project.